BEFORE you continue to the Practice Tests, please be sure to read "Accessing the California CAASPP Practice and Training Tests". In the spring of 2017, the Smarter Balanced Assessment Consortium released a web page featuring a variety of examples of questions that might be found on the CAASPP tests. (These are not intended as "practice" questions.) Click here to reach the "Sample Items" page of their website. A calculator is available for certain items on the 6th-8th Grade math test and the 5th and 8th Grade science test. Click here for an info sheet with links to the calculator so that your student can become familiar with its features. 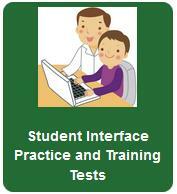 Detailed information about how to use the student interface practice and training tests is available here. After you have reviewed the information, click on the green image at the left to enter the practice testing area of the California Assessment of Student Performance and Progress (CAASPP). This is the California-specific information for the Smarter Balanced Assessments. Two different tests are available for each of the two major subject areas included in the testing: ELA (English Language Arts) and Math. Training Tests are used to help students quickly become familiar with the software and interface features of these computer tests. Practice Tests provide a preview of the Smarter Balanced Assessments, but do not reflect the full range of content that students may encounter on the actual assessments. • a broad coverage of claims and targets that closely mirror the summative blueprint. • a range of student response types. • a breadth of difficulty levels across the items, ranging from easier to more difficult items. • a sample of performance tasks with open-ended response types that allow students to demonstrate knowledge related to critical thinking and application. Click on the desired test below to view the test answers.